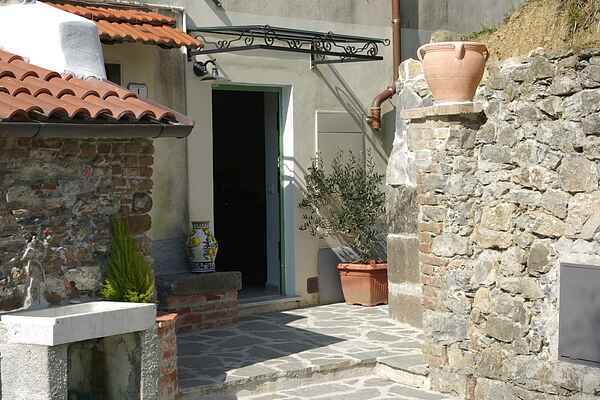 Completely renovated house in the ancient village of San Terenzo Monti in the heart of Lunigiana. The house is nestled in a quiet and relaxing setting, just a stone's throw from the hills of the splendid Apuan Alps and the beautiful Cinque Terre sea. Just 500 metres away, in a small shop reminiscent of old times, you will have the opportunity to taste typical local products including salami, mortadella and sausages made with great care according to ancient traditional recipes. Not far, you can admire one of the oldest churches in Lunigia, recently restored and offering a beautiful collection of old paintings and granite sculptures. In San Terenzo Monti you can also visit the museum of the resistance, containing photos and eyewitness accounts of the Nazi-Fascist massacre that took place on August 19, 1944 (phone reservation required). Do not miss the opportunity to visit the area's medieval castles (the nearest is located just 6 km away) and the famous Carrara marble quarries (marble capital of the world) and taste the famous par excellence Lardo di Colonnata produced locally. Travelling with children? No problem! The Fosdinovo Adventure Park is waiting for you just 5 km away, together with the Apuan riding ranch. In short, whether you are food lovers or hiking enthusiasts, whether alone or with children, you are guaranteed a fun and exciting time! SO WHAT ARE YOU WAITING FOR? MAKE YOUR RESERVATION NOW!